The TF-27 Trident Mini Tanto folding knife from SOG is extremely portable and offers plenty of versatility for outdoor recreational and tactical use. The Tanto-style blade is exceptionally strong and durable at the tip, perfect for penetrating hard targets, while the partly-serrated edge is suitable for slicing through all types of materials. 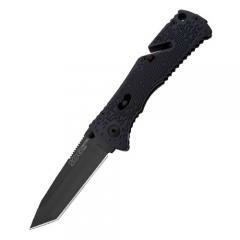 The blade's black titanium nitride coating is wear-resistant and non-reflective. The traditional S.A.T. (SOG Assisted Technology®) opening system has been revamped and replaced with the novel Arc-Actuator® mechanism, providing a more secure lock and faster deployment. The addition of built-in safeties prevent accidental opening and safeguard users against injury. A glass-reinforced nylon handle is built for a secure grip, with variable patterned Digi-Grip® applied to strategic locations for increased retention. The Trident Mini includes SOG's innovative Groove® system, allowing instant and easy cutting of paracords or fishing line without opening the knife.The bayonet-style clip is reversible, allowing for left or right-handed use.